Coombe Crafts was originally established in a small village in Wiltshire in the mid eighties … although we have moved around a bit since then …. To produce unusual and original craft items in a variety of natural materials, with an especial interest in small dolls. A chance encounter with Pat Cutforth and the Marlborough Dolls House Fair, led us into our first real miniature work, and me to polymer clay. We have not looked back. We try to juggle our time to attend a limited number of fairs as it is important to stay in touch, while allowing us to fulfil mail order and commissions, as well as continuing to develop our work. It is still fun and challenging and with the advent of the internet, we can reach even more enthusiasts and make new friends. 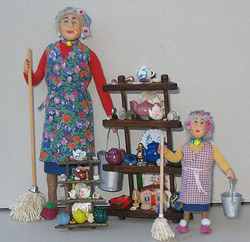 Our original and individually-sculpted character dolls in both 1/12th and 1/24th scales, often elderly, with a bit of personality about them, add to the story of any miniature house. We are happy to costume in all periods, and to discuss individual requirements and characters, so that can we produce the little people you have been looking for. 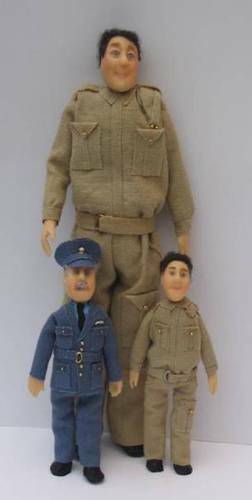 1/24th dolls are priced from around £13 and 1/12th from about £23. We also make ‘interesting things’ to go with them – unusual pieces of furniture and small accessories that bring a house to life. Again, the original and handcrafted items are in both scales and we can work in 1/16th if that is what you are looking for, or craft something to your specification.